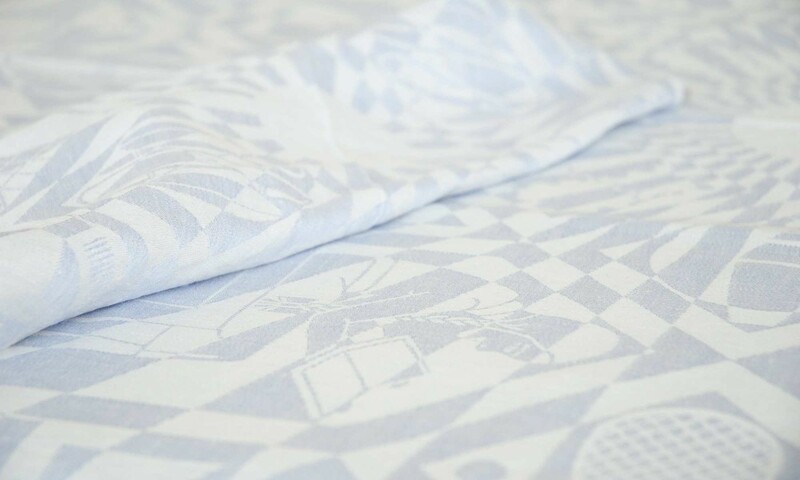 Sanny has acquired the exclusive rights to take the linen damask designed by the artist Chris Lebeau (1878–1945) into production again. 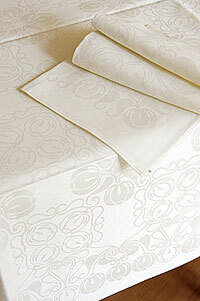 It is the first time that these designs have been woven again and, as then, in 100% pure linen damask. Six designs are available: Butterfly (1905), Peacock (1908), Apple (1910), Tomato (1926), Refraction (1932) and the coloured tablecloth Margotje (1930). Between 1905 and 1939, the Dutch artist Chris Lebeau created at least 57 designs in linen damask for the then leading linen manufacturer E.J.F. van Dissel & Zonen in Eindhoven. No other designer in the Netherlands has so many table linen designs to his name. His design process was unique in that he created a separate pattern for the tablecloth and napkins by combining the basic motif differently in each piece. Lebeau often took his patterns from nature. Critics of the time were full of praise, and his table linen designs were regarded as ‘triumphs in table decoration’, with Lebeau table linen regarded as an absolute must for every well-to-do, modern housewife. In 1932 he created a surprising series of damask that seemed to anticipate the later Op Art, one of which was Refraction. 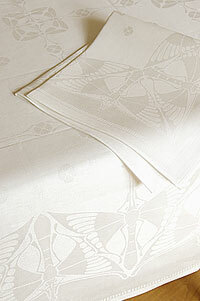 Butterfly was the first Art Nouveau design created by Chris Lebeau for the damask weavers Van Dissel. It is functional and monumental, yet friendly and suitable both for classic and modern interiors. Over 100 years later, the design has lost none of its attractiveness. The butterflies in the borders welcome your guests to your home, and groups of four butterflies are placed at intervals along the table. It is a wonderfully summery pattern. The Apple pattern is rounder and more elegant. The motifs in the border and centre patterns flow smoothly into one another, creating an almost completely filled arrangement. Take a closer look at the clever solution for the corner design and you see the mark of a master, as it is in the corners that the patterns that follow the length and width of the tablecloth come together. 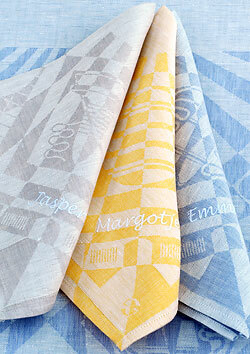 Lebeau designed different variations of the same basic patterns for the tablecloth, the dinner and breakfast napkins. 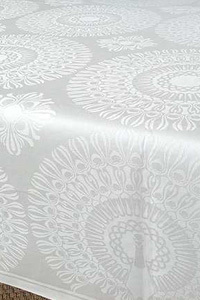 Tomato is a particularly restful design, with small, regularly-spaced motifs on the centre of the tablecloth. 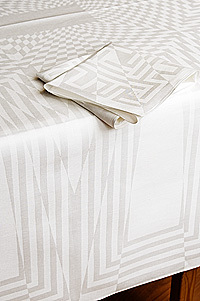 It is especially popular with people who prefer a simpler table linen. The border motif shows long rows of ripe tomatoes with pretty leaves that gently continue on their way around the corners of the tablecloth. Peacock belongs in the countryside, where stately peacocks roam the estate. Along the edges, the peacocks show off their beautiful feathers, and the motif is repeated on the top of the table. The peacock feathers, with their beautiful eyes set off in elegant circles, will please every guest at table. Refraction steals many hearts. This Art Deco design gives a table an air of beauty and magnificence. From the smooth, clean centre line of the tablecloth, hundreds of small squares fan out in increasingly large semi-circles towards the edges of the tablecloth. It could be 1960s Op Art! Nevertheless, Refraction was designed over 30 years earlier by Lebeau, in 1930. Lebeau was years ahead of its time, as art critic Plasschaert wrote in 1966 in response to an exhibition of Lebeau’s artwork in the Gemeentemuseum Den Haag. We have now reconstructed Refraction for weaving again. Refraction is also beautiful in colour and is available in sunny yellow, lavender blue, silver grey or the natural, unbleached colour of linen. There is so much to say about Margotje that we have given it its own webpage. Here you can read all about this Art Deco work of art for children, past and present. Sanny de Zoete not only sells the re-created table linen of Chris Lebeau, but also table linen woven in the Van Dissel linen factory. You can read more about this under antique linen. Sanny de Zoete is co-author of the book Artistiek damast van Brabantse bodem 1900–1960 (Artistic damask from Brabant, 1900–1960), which includes the damask created by Chris Lebeau and other designers. This book is now only available second-hand. In 2002, King Willem-Alexander and Queen Máxima of the Netherlands received a set of Apple damask table linen as a wedding gift from the editors and readers of the magazine Vorsten Royale.